The media and polls all agree – Chatham NJ is one of the best residential communities in New Jersey. When locals refer to “Chatham,” they are actually referring to two neighboring towns, Chatham Borough and Chatham Township. Together, these towns have wonderful homes, parks and amenities, share a vibrant downtown, various public services and a common High School. The 2.4 sq. mile Chatham Borough is centered on the downtown area and its neighborhoods are within easy walking distance to town and the train station. Chatham Township is only a few minutes drive from the town center and tends to have larger homes sited on larger pieces of property. Chatham is one of the most sought after towns on the Midtown Direct Train line. The highly regarded Chatham School District is a major draw for families moving to the area. Chatham Borough and Chatham Township share one school system that strives to “equip each student with the competencies and awareness to succeed academically, professionally, and socio-emotionally.” Chatham parents are very involved with their schools. In 1997, they created the Chatham Education Foundation to help raise money for the district Schools. Since its inception, the Foundation has distributed over $850,000 to the Chatham schools. Chatham High School’s excellence has made it one of the top high schools in the state for many years; “NJ Monthly Magazine” ranked CHS the #1 public high school in 2014 (out of 339 schools). CHS has also been recognized with the Blue Ribbon Award of Excellence, the highest award conferred on schools by the US Department of Education. CHS has an average enrollment of 1,159 students and a student-to-teacher ratio of approximately 16:1. The school offers over 17 AP Classes and has many extra-curricular activities, including an award-winning marching band, an extensive theater program and athletic teams in almost every sport. The mascot for Chatham High School is the Cougar. There are four elementary schools in Chatham. Washington, Southern Boulevard and Milton operate grades Kindergarten through 3. Lafayette School covers grades 4 and 5. In addition to traditional classes, the elementary schools offer innovative learning programs; the new STARLAB Portable Planetarium helps students learn more about astronomy and the solar system and Destination ImagiNation assigns students to teams that learn to solve instant challenges in a very short time frame. The goal of this initiative is to teach the creative process from imagination to innovation. For those looking for private or parochial schools, the following schools are just a few of the many excellent options near Chatham. Working in Manhattan? The commute from Chatham is an easy and relaxing 47-minute train ride on New Jersey Transit Morristown Line. The Midtown Direct trains bring commuters directly into NYC’s Penn Station and the Hoboken Line brings commuters to Hoboken, NJ where Ferries and Path trains easily carry commuters into lower Manhattan. The train station is located in the heart of downtown Chatham Borough and offers parking to residents for an annual fee of around $435.00. Metered parking and bike racks are other options available to commuters. Located right off Route 24, Chatham is near I-78, the Garden State Parkway, NJ Turnpike, I-287 and Route 280. This easy access to major highways guarantees Chathamites smooth driving to and from New York and Newark and as well as convenient round-trip travel to all points north, south, east, and west. NJT’s MCM-3 bus connects Chatham to Madison, Morristown, Livingston Mall, Short Hills Mall, Morris Plains and Greystone Park. Area airports are also within easy reach; Newark Liberty International Airport is only an 18-minute-drive away. The Chatham Recreation Department offers a broad array of sports and activities to residents of the Borough and the Township, including basketball, baseball, field hockey, swimming, flag football, lacrosse and many more. Baseball fields, soccer fields, tennis courts and open green spaces are spread throughout the town providing plenty of opportunities for family fun. For nature enthusiasts, Chatham has some of the best outdoor parks and reservations in the area. The Great Swamp National Wildlife Refuge is a 12-square mile (7,768 acres) natural oasis that is home to a wide variety of wildflowers and plants and more than 244 species of birds, foxes, deer, muskrats turtles, fish, and frogs. There are more than eight miles of trails, and the Great Swamp Outdoor Education Center (open every-day, all-year long) runs environmental programs for all ages to help visitors learn more about this living, breathing botanical and zoological resource. The Passaic River Country Park provides another 770 acres waiting to be explored. Located along 5,000 feet of the Passaic River in Chatham Township, this park invites visitors to enjoy athletic fields, picnic areas, hiking trails, fishing spots, x-country skiing, snowshoeing and more. Looking for a playground? Try the Shunpike Castle Playground, Memorial Park, Garden Park, Stanley Park or Sheppard Kollock Park. For fun in the pool or pond, Chatham residents can choose to swim at the Memorial Park Pool, Noe Pond Club, Chatham Fish & Game Club or the Colony Pool Club. Options for golfers include the Fairmount Country Club, located on Southern Boulevard, as well as many private clubs nearby, such as Canoe Brook Country Club or Baltusrol Golf Club. Residents of Chatham enjoy a wide variety of dining choices and cultural events. From casual pizzerias and delis like Wards Coffee, the Chatham Sandwich Shop and The Bean Curd to more formal restaurants such as Restaurant Serenade and Scalini Fedeli, Chatham has something for everyone. Click here to see what Yelp has to say about the local scene: Yelp, Chatham NJ. For fans of the dramatic arts, the Chatham Community Players offers great theater to the town. In addition, the town hosts several Arts and Crafts festivals throughout the year, a summer concert series and other family-friendly events. The nearby Fairleigh Dickinson and Drew Universities offer many additional cultural programs, such as Drew’s The Shakespeare Theater of New Jersey. 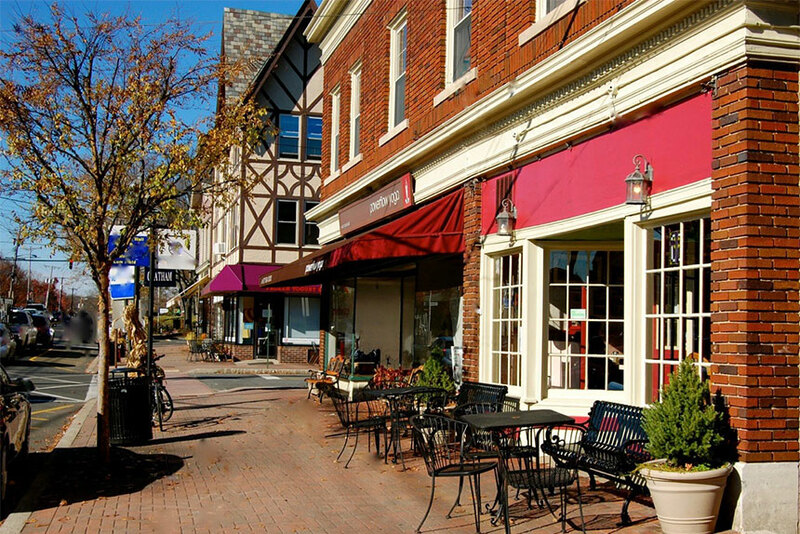 Shopping abounds…walk through the quaint downtown of Chatham and find F. Gerald New Jewelry & More, DJ Crater, Jabberwocky Toys, Quartet Decor, head over to Chatham’s Hickory Tree Shopping Center, or go high-end brand shopping at the Mall at Short Hills. If you’re looking for fresh, The Chatham Farmer’s Market is located by the train station and takes place every Saturday from June through October. All shopping is nearby and easy to reach. The community that is now Chatham Borough began in 1710 as a colonial English village. In the early nineteenth century, mills along the Passaic River provided power for the production of flour, machinery, lumber and textiles. The arrival of the Morris and Essex Railroad 1837 led to sharp increases in Chatham’s population. By the 1880’s, many large greenhouses occupied the edges of town and Chatham became a center for the rose-growing industry. At about the same time, New Yorkers began travelling to Chatham Township to enjoy the river, a nine-hole golf course, and the dancing, bowling, bar and fine cuisine of the Fairview Hotel. In 1892, most of the villages of Chatham Township abandoned their own governance and adopted the Borough form of governance. The Township governed mostly unsettled lands until after World War II, when farmlands, greenhouses and flower nurseries were sold off to make room for suburban development. Today, both the Borough and the Township provide amenities and strong services to many happy suburban residents.